Medical textiles remain one of the most dynamic areas of research in textiles. Medical and healthcare textiles is the fourth in a series of conferences held at the University of Bolton. Like its predecessors, it has attracted papers from some of the leading international centres of expertise in the field. 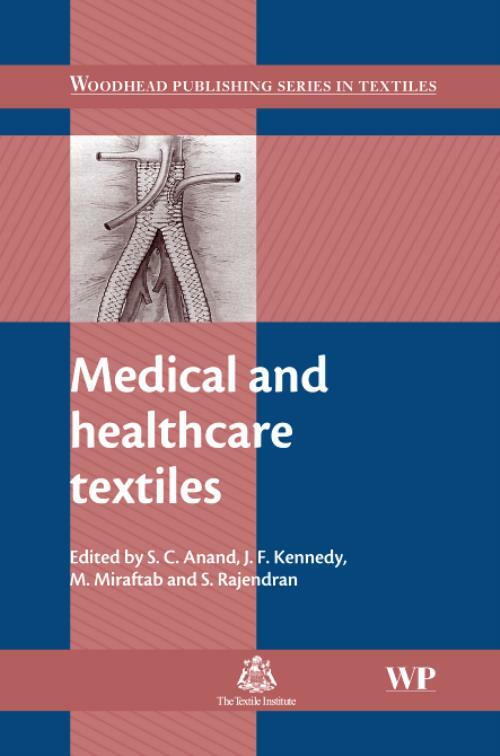 Contributors cover a range of topics including emerging textile-based biomaterials, hygienic textiles, the use of textiles in infection control and as barrier materials, bandaging and pressure garments for managing chronic infections such as ulcers, the role of textiles in the management of burns and wounds, textile-based implantable devices such as tissue scaffolds and sutures, and intelligent textiles. Part 1 Infection control and barrier materials. Part 2 Healthcare and hygiene products. Part 3 Wound care materials. Part 4 Bandaging and pressure garments. Part 5 Implantable materials. Part 6 Medical devices. Part 7 Smart materials and technologies. Part 8 Industry standards and regulations. Anand, Subhash C.Professor Subhash C. Anand MBE is Professor of Technical Textiles at the University of Bolton, UK. He has published over 200 textile research papers and holds six patents in technical textiles. He was awarded Member of Order of British Empire (MBE) for services to higher education and textile industry in 2008. Kennedy, J FJohn F. Kennedy is Director of the Birmingham Carbohydrate and Protein Tehcnology Group, School of Chemistry, University of Birmingham. He is Director of Chembiotech laboratories and is also Professor of Applied Chemistry at The North East Wales Institute of higher Education (NEWI). He is a Fellow of the Royal Society of Chemistry, the Institute of Management, the Institute of Food Science and Technology and the Institute of Biology. He is also editor of the journal, Carbohydrate Polymers. Miraftab, MDr Mohsen Miraftab is a senior lecturer and researcher at University of Bolton and has published a wide range of publications in medical and technical textiles. Subbiyan Rajendran (Raj), PhD AIC FICS CText FTI is Emeritus Professor at the University of Bolton, Bolton, UK. He recently held the position of Professor of Biomedical Materials and STEM (Science, Technology, Engineering and Mathematics) Champion. He is internationally recognised for his eminent research in biomedical materials and has authored 173 publications and that include 5 books, 6 monographs, 21 book chapters and 8 patents. In addition to academic activities, Raj is actively involved in Textile Institute's affairs for many years. He is a Fellow of the Textile Institute (TI) and is currently representing its Council and Professional Qualifications Award Committee (PQAC), and was Chair for PQAC for 4 years. He is the recipient of a prestigious Research Fellowship award from the United Nations Industrial Development Organisation (UNIDO).